Visiting Napa Valley in the off-season has its charms. For starters, daytime temperatures are comfortable, tasting rooms are less crowded and restaurant reservations can indeed be had. Plus, with a minimum amount of planning, you can secure private tasting appointments at great wineries where you won’t feel rushed or rustled by season-harried staff. For those on a budget, bargains and hidden gems abound, from restaurants to lodging and shopping. El Bonita Motel has an Art Deco history dating back to 1956. 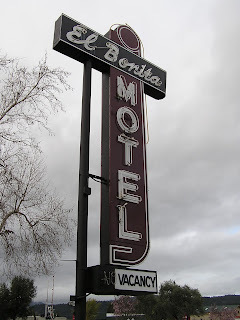 We chose St. Helena as home base for sisters’ weekend, in part because a two-bedroom unit at the El Bonita Motel was available for only $150 a night. Located in the renovated building farther back from busy Highway 29, our rooms were comfortable, clean and warm, each with its own balcony and with breakfast included. Parking is ample and the location is within striking distance of Yao Family Wines, Yao Ming’s beautiful new tasting room, V. Sattui (a 15-minute walk away for the daring) and only a few miles from Corison, Vine Cliff and Beaulieu Vineyards, among many others. 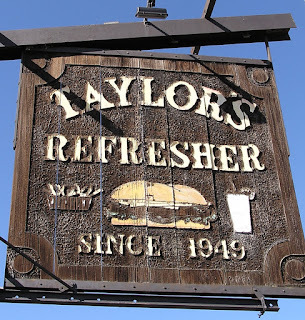 Fuel your Napa Valley adventure with lunch at the reliably excellent Rutherford Grill. After petting the bronze pig in the garden, step into the expansive dinner room with its open kitchen and hunger-stoking hickory smoke aromas. Settle into a cozy booth or, if you sit at one of the long counters, you might find yourself seated next to a local winemaker grabbing a quick bite, probably washed down with a palate-refreshing beer. Your Napa arrival deserves a toast and Schramsberg brut rosé fits the bill, a delectable pink bubbly served in classy flutes. For starters, go with the grilled artichokes or share a grilled seasonal vegetable platter (ask about it if it’s not on the regular menu). For your main course, you won’t go wrong with any of the Rutherford burgers, the BBQ combo plate or rotisserie chicken, especially with their perfectly cooked wild rice. Lighter choices include the flying tuna platter and the kale and tender rotisserie chicken salad with roasted peanut vinaigrette. Save room for the cornbread, too. With food in your tummy, wine tasting is next. As more Napa tasting rooms now require appointments, plan ahead to visit some of the more in-demand or prestige wineries. Be flexible to improve your chances of securing a hot ticket by requesting a visit outside of the busy 1 – 4 pm time slot. This trip, we chose Quintessa, perched high atop a hillside along the Silverado Trail one day, and picturesque Rombauer the next. More on those awesome experiences in another post. Drop-ins are welcome at St. Supéry in Rutherford. The bright and airy new tasting room offers different tasting flights of the winery’s 100% estate-grown wines, served by friendly and informed staff. For variety and quality, the broad and consistently delicious St. Supéry portfolio is tough to beat. Standouts from the two different tasting menus included the Napa Valley Estate 2014 oak-free Chardonnay, the outstanding 2012 Élu Estate Blend – a great food wine – and the silky Dollarhide 2012 Elevation, a blend of Cabernet, Malbec and Merlot. Considering joining a wine club? 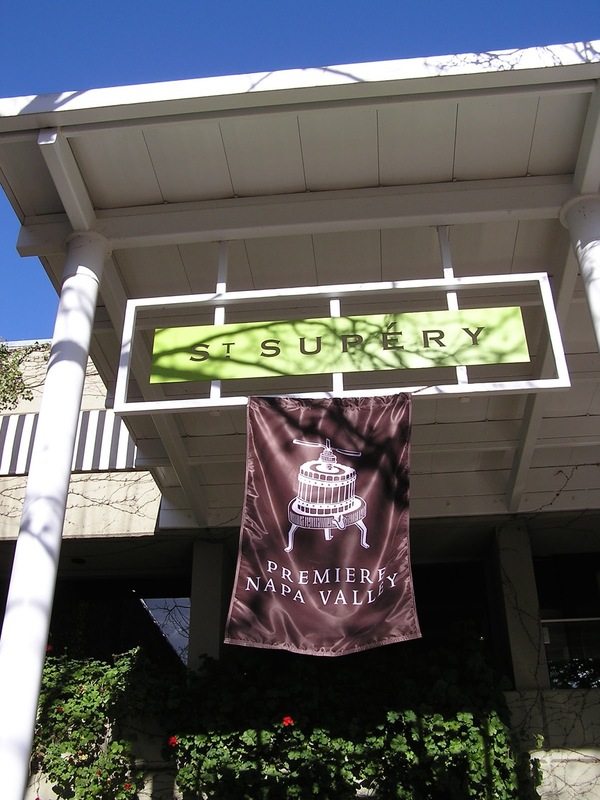 St. Supéry offers value, perks and options, including red-only or white-only wine clubs. Devotees of their popular Moscato can choose to belong to its own club. Yes, it’s that good. By now, a down-home dinner might sound about right. If so, head to the Farmstead at Long Meadow Ranch. Housed in an old barn, the restaurant sits alongside a popular café and gift shop. The reasonably priced menu features organic, farm-fresh vegetables and grass-fed beef and lamb from their own farms. Don’t miss their fresh-smoked dishes too – the heritage St. Louis ribs are sure to hit the spot after a long day in the tasting rooms lifting and lowering wine glasses. Like the excellent American bistro Market in downtown St. Helena, corkage fees are either waived or much-reduced. We took the bring one, buy one approach. The next day, venture into downtown St. Helena for a range of shopping and yes, more wine-sampling ops. The hip and cavernous tasting room at Orin Swift Cellars, maker of Papillon and the I, F and S Locations wines, welcomes up to six people, with appointments required for larger groups. Don’t look for Prisoner here, however. Winemaker David Phinney sold that label in 2013 to Hunneus Vintners, owners of Quintessa. The staff next door at St. Helena Wine Center, owned by the Beringer family, will help you find even more wine to purchase, bring to dinner or ship. 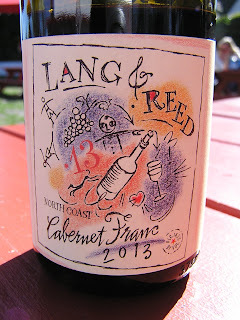 They offer a wine club customized to what you like and don’t like, plus a selection of rosés seldom seen outside of Napa Valley. Even if you’ve blown your budget in the trendy boutiques, wander up to Steve’s Hardware & Homeware where you’re sure to find something you simply can’t live without. Comb through their well-stocked kitchen section tucked away on the right and their Napa-themed gifts. Cross the street to savor a tasty energy boost at Woodhouse Chocolates. Another family-owned business, Woodhouse boasts sparkling glass display cases housing perfectly arranged small and irresistible chocolates. Sad to have missed their seasonal Oscar-like chocolate statuette, we consoled ourselves with petite heart of darkness, dark hazelnut and espresso treats. The name of the Napa Valley drive-in was changed, but the sign remains. Don’t even consider leaving town without a stop at Gott’s Roadside, also on Highway 29 in St. Helena. Surrounding the grab-and-go food mecca are shaded and sunny picnic areas where you can relax and relish your meal in comfort, hardly aware of the whizzing traffic nearby. Known for their burgers and shakes, keep an eye out for specials such as the po’ boy on a crunchy toasted egg bun and their special shake selections (peanut butter and chocolate, oh my). Want fish instead? The ahi burger is not to be missed. Best of all, you can wash down all this goodness with a half bottle of Lang & Reed Cabernet Franc, a perfect ending to a perfect weekend.